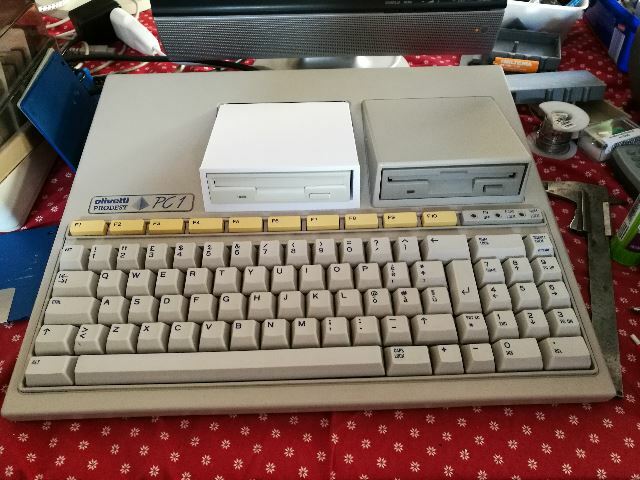 I have recently aquired an Olivetti Prodest PC1. Previously I have been modestly interested of vintage PC:s, but the Olivetti caught my interest as it is shaped like an early all-in-one home computer, like the Atari ST. The computer is an IBM XT clone using a NEC V40 CPU. It is not 100% compatible, but it runs most of the games that I throw at it. It came in three different configurations, one 3 1/2 inch drive, two 3 1/2 inch drives and a HD version with one 3 1/2 inch drive and an internal hard disk. Mine is the single 3 1/2 inch drive version. My computer did not come with a boot disk. A DOS version 3.20 boot disk can be found at http://www.ti99iuc.it/web/go?QM9DET. Note that it is an italian version . The disk image can be written with various tools. I have a retro PC running a version of Slackware Linux that I use. Under linux the disk image can be written to a floppy with the the dd command. The two floppy version looks really cool, so I wanted one of course. I designed a floppy case myself and 3D printed it. It fit very well without the floppy, but the 1.44 MB floppy that I put into the case had the floppy connector on the wrong side compared to the original drive. The floppy cable was too short so I had to extend it. When the extended connector was inserted into the drive I got an issue with fitting the case as the floppy cable takes too much space behind the case. I have not found a solution to that yet. Also I need to paint the case. I will try a color with the code RAL7044.